Once the keyword is typed into local, the bot will reply with your rule straight away. 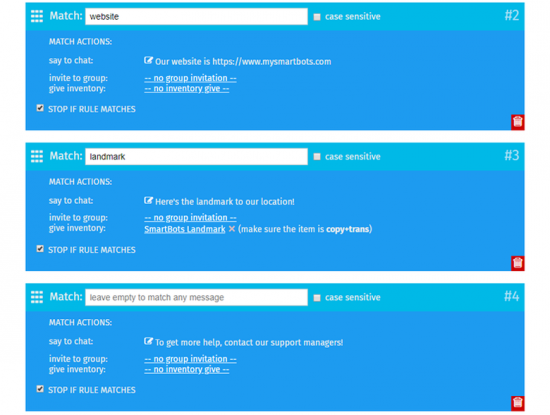 To know about rules and see the examples, visit LocalChat Autoresponder docs. This new feature is a great way to let your bot handle the most common questions and offer simple support, including welcoming guests, answering questions and sending group invites and items. If you leave Match message blank, that rule will react on any message. There is no limit on how many rules you can create. The rules on top take priority over the one on the bottom. If you are using give inventory feature, make sure the object has copy + transfer permissions. 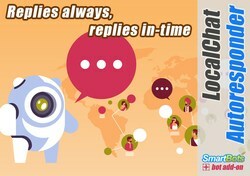 To purchase the LocalChat Autoresponder, visit add-on store page. For more information and questions contact our Support Staff!